SCVHistory.com | Sitzman's Mentryville Collection Comes Home, 2004. Historical Society receives donation that sheds new light on Pico Canyon oil town of Mentryville  including documents once in possession of Mentry himself. 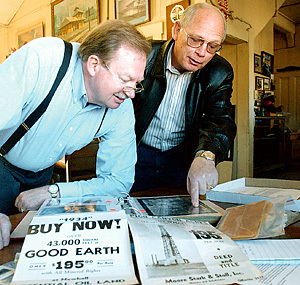 Rick Winsman, president of Friends of Mentryville, left, and past president Duane Harte peruse the Pico Canyon memorabilia of Barbara Sitzman Cook on Wednesday at the Saugus Station in Heritage Junction. Among the artifacts are depression-era ads offering land for $195 per acre in Pico Canyon with oil and mineral rights. Photo: Eddie Sadiwa/The Signal. Click image to enlarge. Merle Cook heard all the stories before — how his mom used to slide down the hill behind the "big house" to pass the time of day, and how the kids would dam up the stream and create their own swimming hole. Like most kids, he thought the stories were boring. "These were things she always referred to. That was her life," Cook said Friday. The long-ago memories were based on the years his mother, Barbara Sitzman Cook, lived in Pico Canyon. As a child, from 1927 to 1937, she lived in Mentryville and attended Felton School while her father worked as the superintendent of the oil field. For years, Merle Cook's mother carted around two steamer trunks full of photographs and newspaper clippings. Before she died, Cook spent two days with her in 1995 going through the photo albums, numbering and recording the information of people in each photograph. He recorded his mother's descriptions on audio tapes. He boxed up the photograph albums, audio tapes, 35mm slides and newspaper and magazine clippings, and sent them to the Santa Clarita Valley Historical Society a week ago. "There are just some things that should not be forgotten," Cook said. When members of the Historical Society and Friends of Mentryville opened the box, they couldn't believe their eyes. Included inside with the scrapbooks were time sheets for the oil workers, Felton school programs and report cards, oil well production reports, and a hint that the Pine Street-Railroad Canyon area of Newhall went by a different name in 1876. Rick Winsman, president of Friends of Mentryville, perused many of the items. 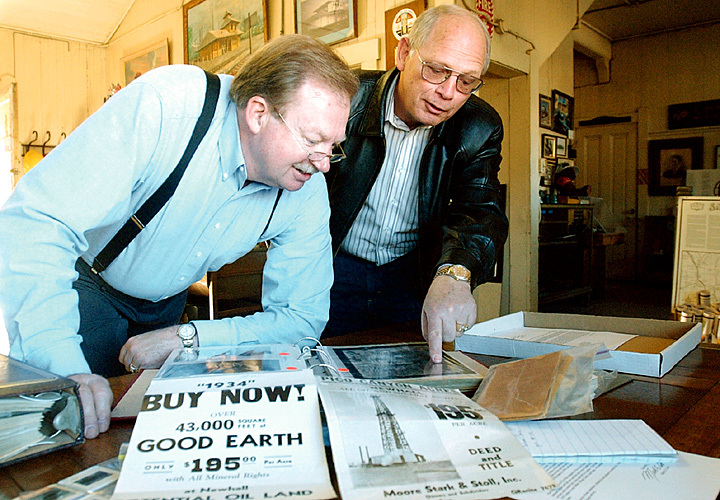 He said the photographs and scrapbooks verify most of what the organization had come to know about Mentryville — the first oil town in California, which grew up around the state's first productive oil well. "How many times do we know of people who go into their attic and find a box of photos and not recognize the faces so they throw them away?" Winsman wondered. "How much of our history is lost like that?" Winsman was particularly thrilled with documents that had been in the possession of Alex Mentry. Born Charles Alexander Mentrier in France in 1846, "Alex" Mentry came to America at age 7. His father, Peter, a blacksmith, Anglicized the surname when he moved the family to Pennsylvania. Mentry excelled at all things mechanical and became a driller. He moved to the Santa Clarita Valley, spudded a successful oil well in Pico Canyon where others had failed, and soon started gravity-feeding oil through a pipe to the Pioneer Oil Refinery on Pine Street. According to photographic records in the Cook collection, the Pine Street area was called Elayon before it became part of Newhall. Oil workers flocked to the area. A community — Mentryville, named for the chief driller — took hold in Pico Canyon. Families lived in redwood cabins, most of which sat far enough apart for their owners to run a few horses and cows. Children tended chickens and calves while older teens hunted deer and rabbit. Mountain lions, which preyed on deer and livestock, were trapped and sold at market or poisoned. Unskilled laborers in the late 1800s earned $2.50 per day. Experienced drillers raked in $4. They worked 12-hour days, six days a week. 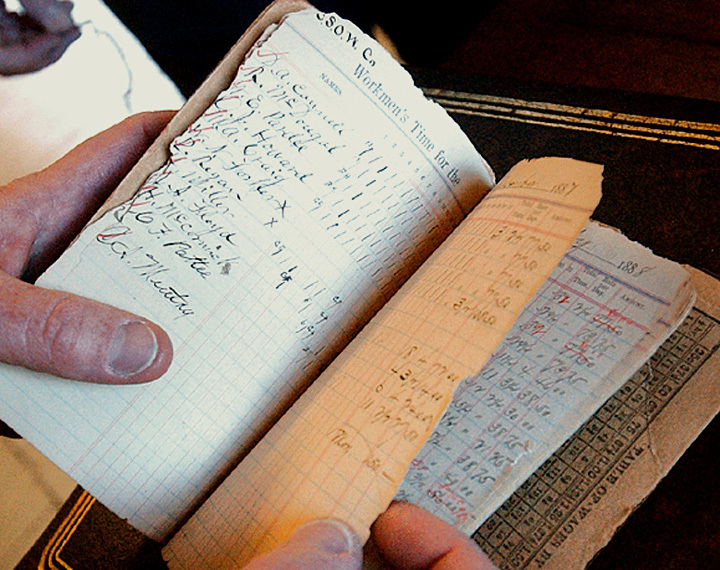 Included in the Sitzman-Cook collection is the original book where Alex Mentry logged his workers' hours from 1887 to 1889. Photo: Eddie Sadiwa/The Signal. Click image to enlarge. Part of the Cook collection contained an original time book from Alex Mentry dating back to 1887. "That's historically significant," Winsman said. "We've never had anything that was Alex Mentry's." Of particular curiosity to Cook were Depression-era advertisements offering land in Pico Canyon  with oil and mineral rights  for $195 an acre. All of the items in the Cook collection will be copied and archived. The copies will be used in the design of a master plan for Mentryville to include several of the town's buildings such as a dance hall that once stood next to the Felton schoolhouse. Winsman said members of the Friends of Mentryville are planning and designing an electronic, self-guided walking town of the grounds to be used by students studying the history of the Santa Clarita Valley. Merle Cook said he was pleased to be able to supply the Historical Society with the Mentryville documentation. A lifelong resident of Newhall, Cook moved to Missouri two years ago and keeps up with local news. He has researched his family tree and that of his wife, Sherry, and said family documents can help define history. He urges people to spend time with their parents, grandparents and anyone else who may have stories or photographs of a place in time. "If not," he said, "You'll have all these pictures and you have no idea who any of these people are." ©2004 The Signal | Used by permission | All rights reserved.